People love us. Just saying. But seriously, for most people, your home is the most valuable asset that you have. It’s important to find a Realtor you can TRUST and have CONFIDENCE in. People choose to work with us because of our commitment to working for you! 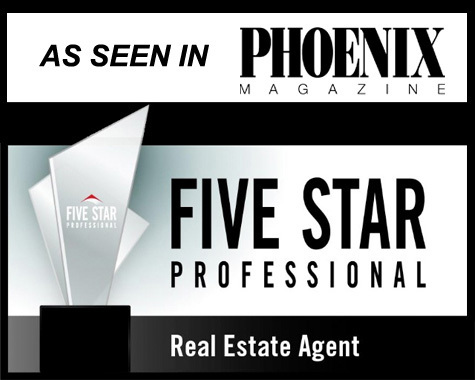 We are dedicated to our clients, provide outstanding service and have years of experience in the Phoenix residential real estate market. We work with both buyers and sellers and are focused on you achieving your goals. As an independent real estate agency, we feel it's important to distinguish ourselves in ways other companies don't. We're members of the Better Business Bureau and are proud of our excellent history. We're proud of our agents! Butch Leiber has twice been awarded a Five Star Real Estate Award which honors local real estate agents. Less than 3% of the valley's agents are honored with the award and we're proud he's included in the list. Kimber Devoe has been awarded a Rising Star Award for her outstanding commitment to excellence. Surveys respondents submit their opinions on criteria such as overall satisfaction, customer service skills, market knowledge and referability. We're proud of Kimber and Butch.